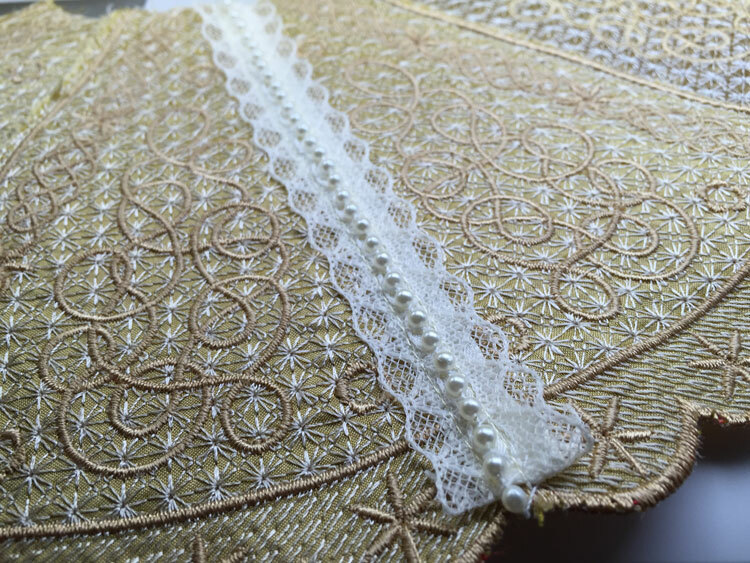 She was made with the smallest skirt panels which fit the 5″ by 7″ hoop. 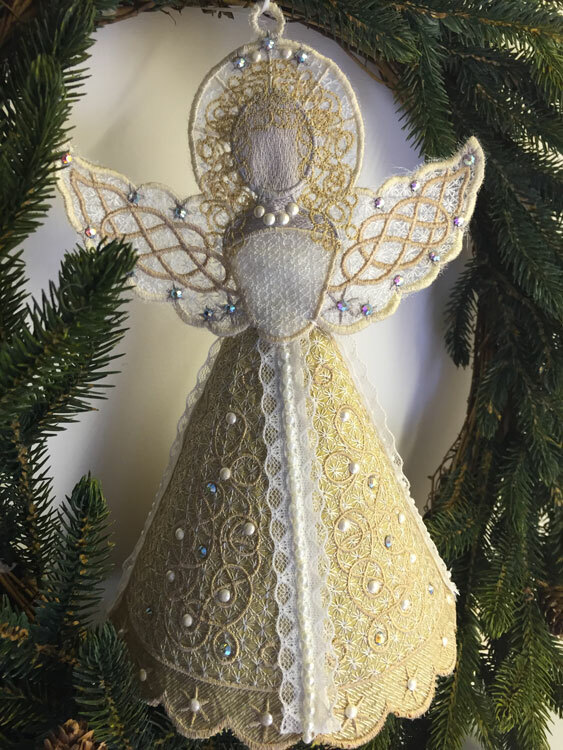 There are 4 skirt sections in this angel. The pieces were overlapped slightly and sewn on my machine. 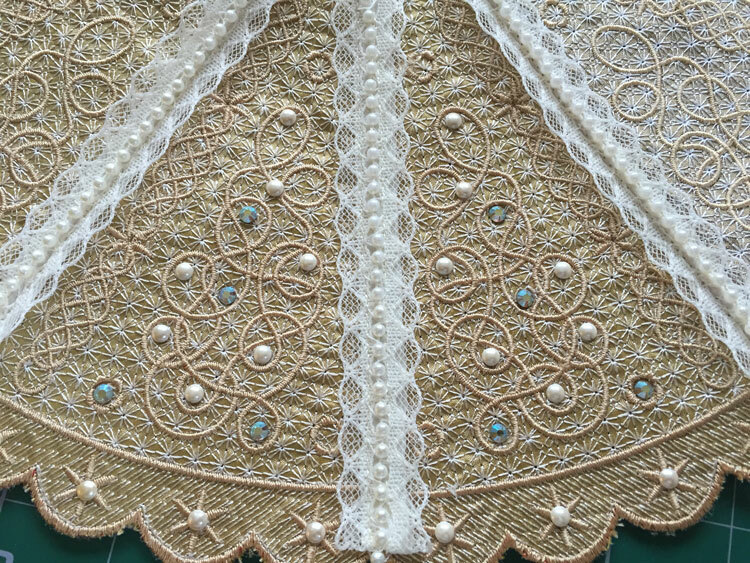 I covered the seams with some lovely ivory ribbon lace with a pearl trim stitching as close to the pearls as possible with my zipper foot. This worked perfectly so in decorating her skirt I added more pearls and some crystals to match those on her bodice. 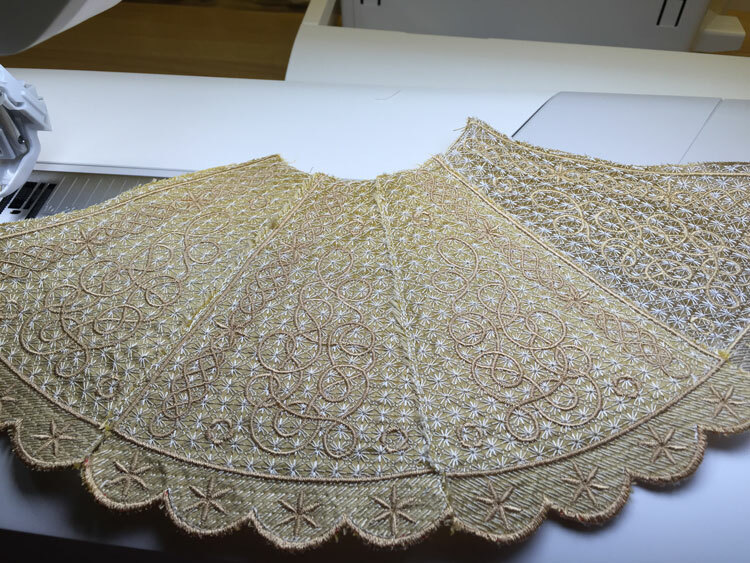 Then the Pellum underskirt was attached to the skirt. 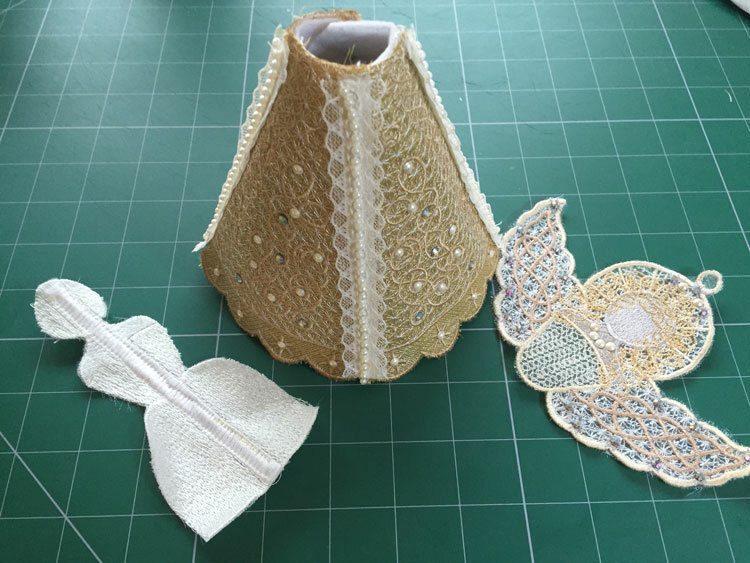 The support is sewn on the back of the top of the angel and then inserted into the skirt. It is important to secure the skirt in such a way that she doesn’t have too thick a waist line. 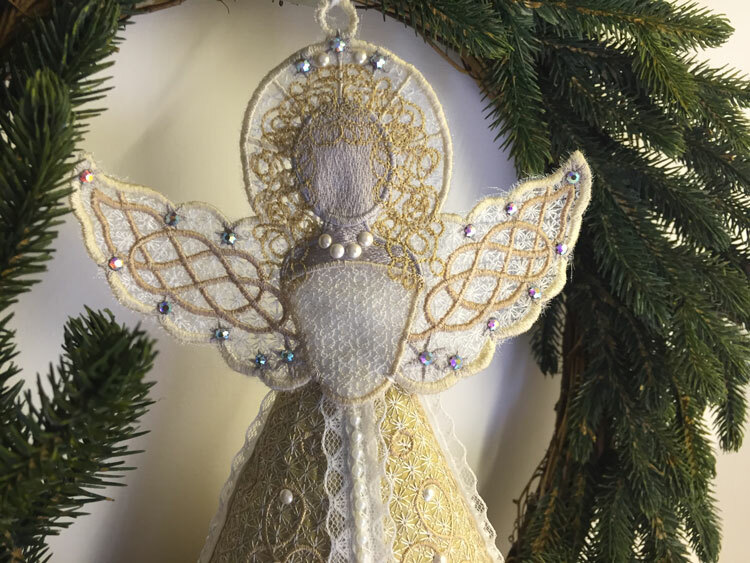 The angel that sat upon my tree over Christmas needed some extra support in the wings by the time the decorations came down. This can easily be done my trimming horse hair and attaching it to the under side of the wings with very light stitches. See this difference this makes to my original angel. This is so worth doing as the weight of the crystals can spoil the way the wings hang over time. 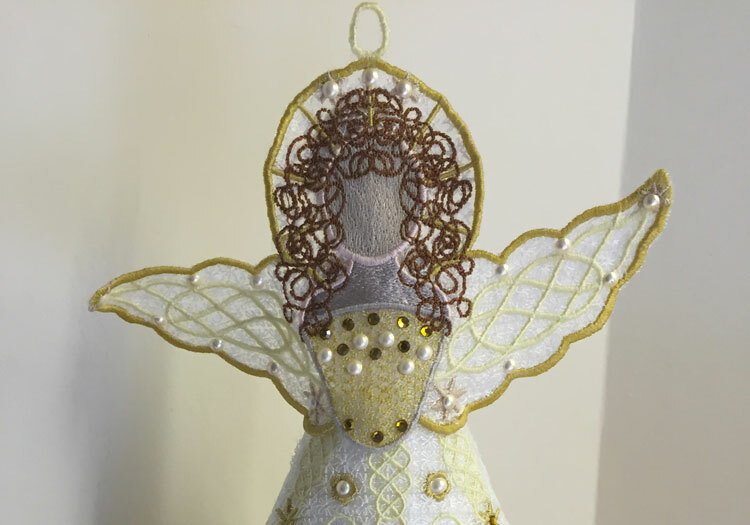 Here is my second finished angel. 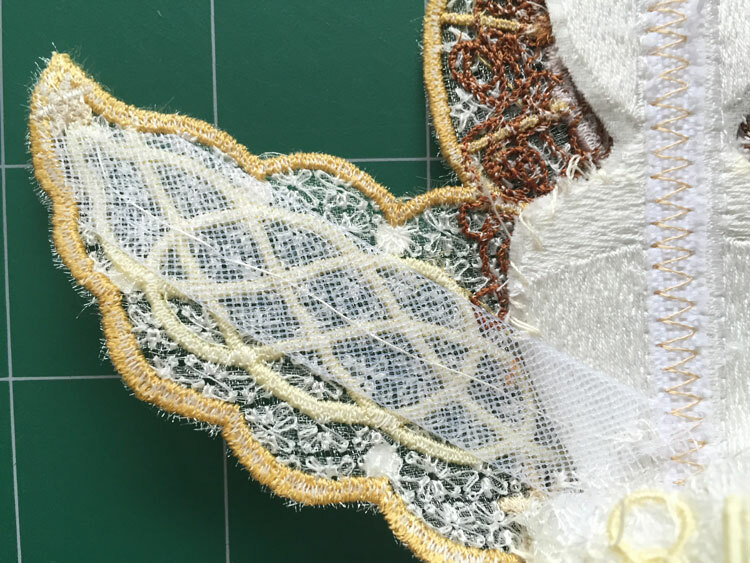 Her skirt has been embroidered on silk with a heat away stabiliser to make the scallops, but there was not need to remove this as it gave support to the sections. 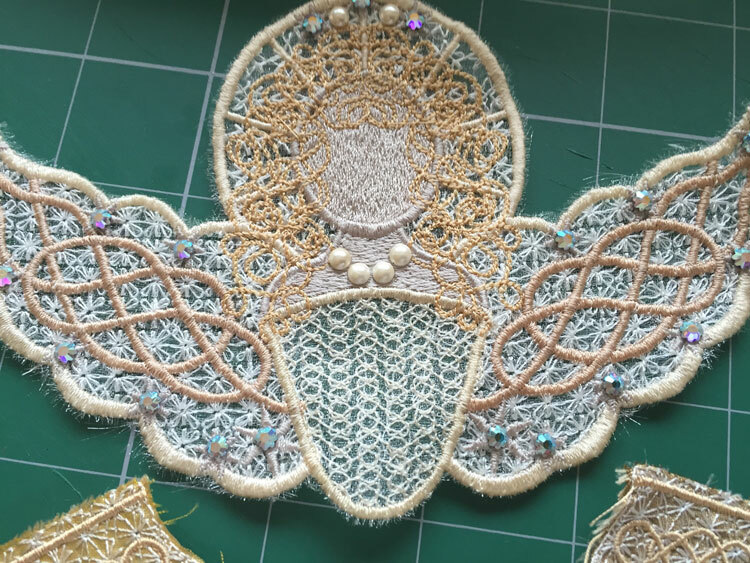 Full instructions on making the scalloped edges is included in the PDF tutorial which comes with the Celtic angel designs. 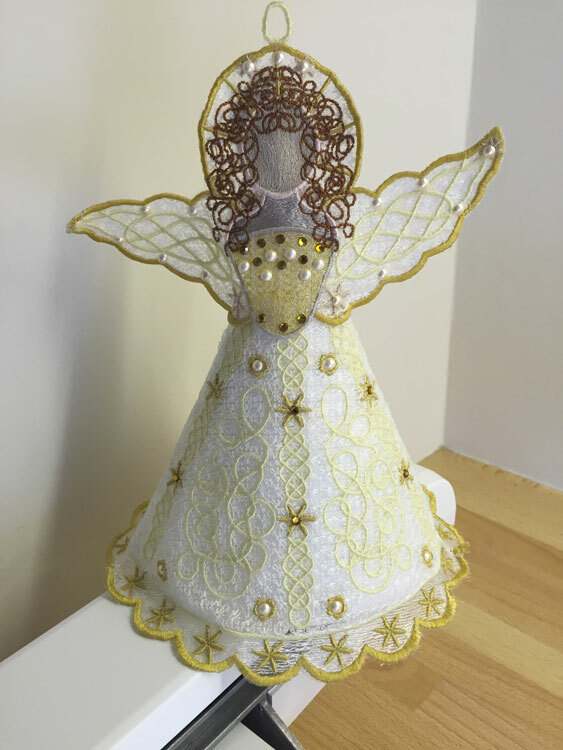 This entry was posted in Embroidery projects and tagged Celtic Designs, Christmas, Crystals, Embellishment, embroidery on silk, heat away stabiliser. Bookmark the permalink. does it come with All changes if I buy it now ? Yes all the updated designs and new tutorial are in the product when you purchase it. Hazel, this is obviously a design close to your heart! You have done some awesome troubleshooting with the design. It was beautiful to begin with and is now outstanding! You are right because in perfecting this angel I can move on to create further more detailed angels. She’s beautiful Hazel! I don’t think it’s possible for you to design anything that’s less than gorgeous.